I don't know what else to do with my life, I really don't so I wanted to see if I can come up with some type of board game using dices (I remember it, nah I totally forgot d20 and all that, maybe someone can point me in the right direction to learn about the dice again). I have a small brain wave of the board and what I'm aiming for. I wrapped the alpha proto-type up on paint how i want the board to sort of look. I mainly posted this to see what everyone likes? At first glance it reminds me of the Glass Bead Game described by Herman Hesse and others, you could look at that for ideas. Basically you put beads in each socket that represent ideas or concepts, and to put a bead nearby it must have a meaning that associates with it. Maybe you want to use dice instead somehow? Good luck; sometimes periods of your life where you don't know what else to do can end up being very fertile, though it may not seem that way at the moment. Did you mean to post this here? This forum is for RPG design. Maybe there is a board games forum somewhere that it would fit in better? Looks like a node map for an abstract military conquest game to me. Armies move along lines between points and fight when they meet. Nodes provide resources and/or victory conditions. I'm not completely sold on the offset hexagon in the middle, from a visual p.o.v. You could avoid the need for it by making the whole board hexagonal (i.e. 6 colours/ kingdoms instead of 4, like Chinese Checkers). 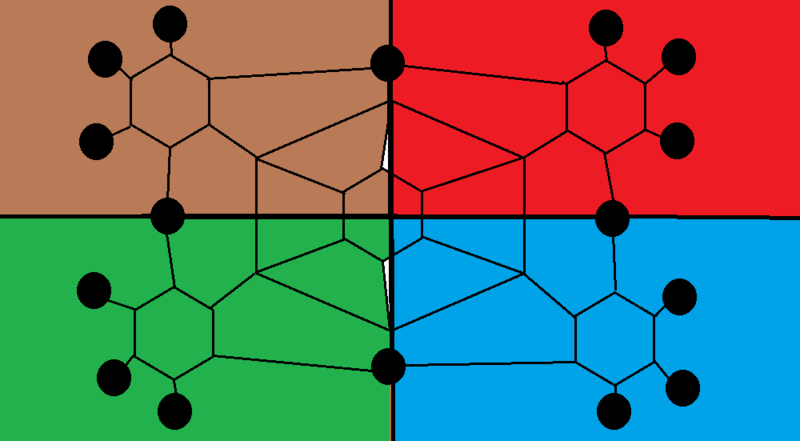 Or by using thick, white lines to join the nodes (or divide the quadrants). Assuming that the hexagon in the middle is raised I'm liking the general aesthetic of the board. The central hexagon coloration is a bit odd though, as are some of the line widths. What are you thinking for functionality?